Totally makes sense @itsmpro92. The problem is; if you allow manual Computer Group creation, you open the door for people to essentially do it whatever way they want. I’ve been deleting groups that don’t meet current requirements, but it is a never-ending task! Unless you meant some specific around “process control”? How about a client setting, with an associated Retrieved Property, that can have multiple values? Then the operator targets actions “By Property”. Client setting: "My Almost-Manual Groups List"
action query parameter "NewGroup" with description "Enter group to add to client:"
action query parameter "RemoveGroup" with description "Enter group to remove from client:"
I’m not sure this is any more efficient than just using manual groups though, you still have a potential to get all sorts of unmanaged setting values on the clients. 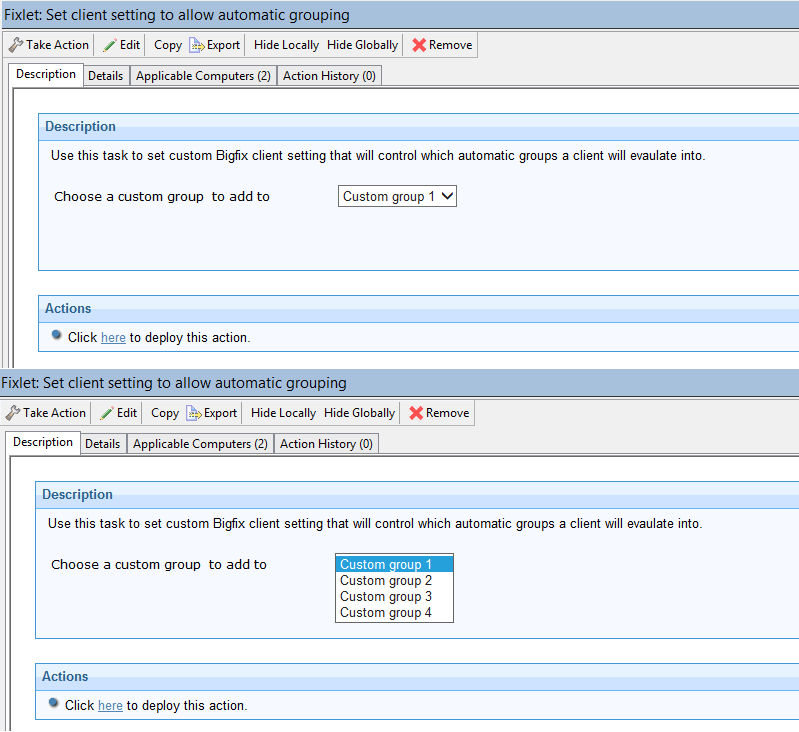 Manual Groups should only be visible in that specific users Operator Site. If you have a bunch of Master Operators doing this, then the manual groups end up in the Master Action Site; but it’s really a symptom - Master Operators really shouldn’t be sending actions to clients, outside of perhaps a small number of deployment-wide Policy Actions, such as Inventory scans, Unmanaged Asset Scans, or BigFix infrastructure upgrade/deployment. @it_cat - Since manual Computer Groups are useful entities, but come with costs to the BigFix infrastructure, I was suggesting that you formalize their management, and put them under Change control. You could use the Comments feature, and record any approvals. It might also prove helpful to educate the operators on the impacts their decisions have on the larger BigFix infrastructure. This does seem to be more a process issue though I’m lucky not to be in an environment where I have to manage/housekeep the content of numerous ops. Just thinking out loud, in a very similar approach to @JasonWalker, how about a custom setting that is set by a task then then allows an endpoint to evaulate into an automatic group? Say you have automatic groups using relevance, eg exists setting "_MyCustomGroups" whose (value of it contains "Group_Custom1") of client and your ops use a fixlet that has HTML drop down that the ops selects the group from. This way may be a bit more overkill and does require the task/fixlet to be updated at the XML level to add/remove items from the dropdown list but if control was one of the requirements, this means ops can only set client setting for the groups you include in the task permit.